When I created a post several years ago on doing metric to imperial conversions, and vice – versa, I added a PDF of a set of scales I made for converting 1/4″ to metric 1:50 thinking someone might find it useful. Well, it’s now been downloaded over 9,000 times so I’m glad I included it. Some people have had trouble finding a particular link to a book or diagram I’ve included in a past post so I’ve included two new pages in the header above with lists of the digital books I’ve mentioned and links to the various tools I’ve created to make it easier to find them. 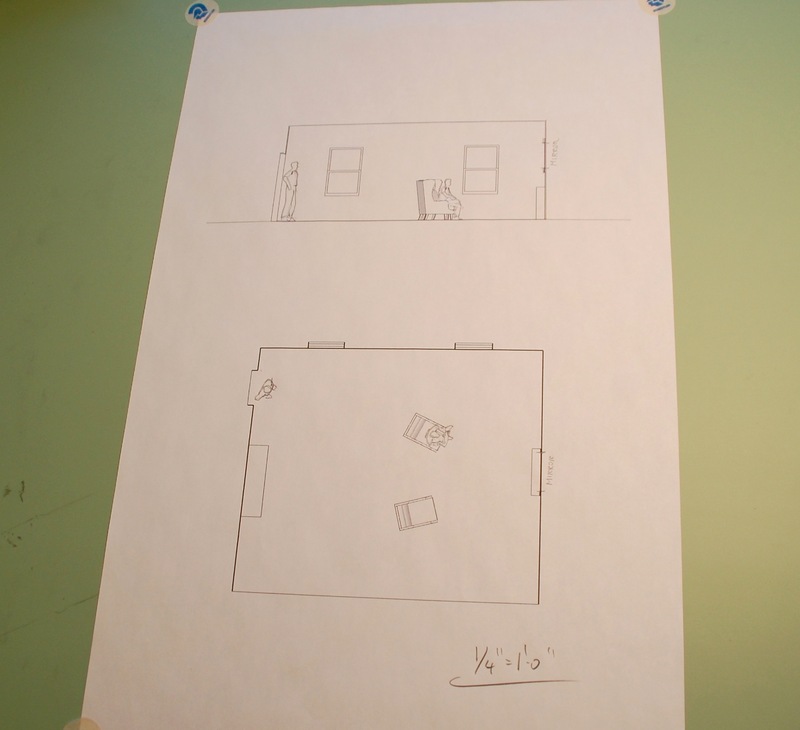 It doesn’t happen often, but you occasionally have to calculate reflections. 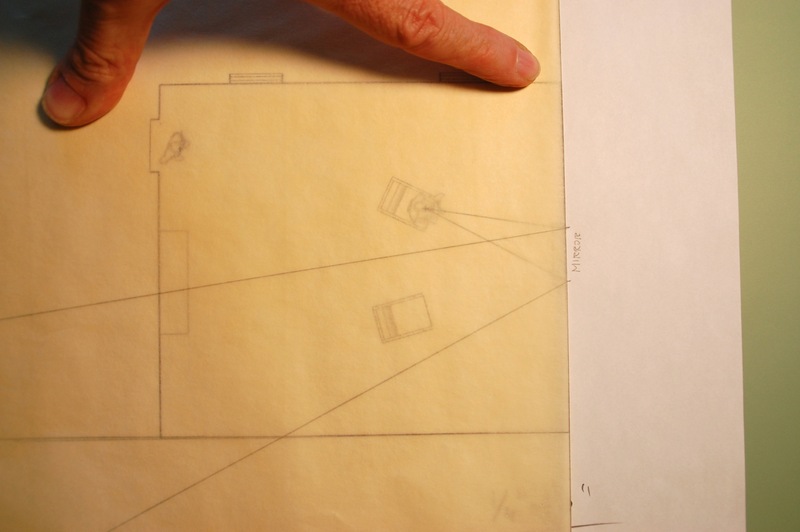 A scene will be staged in a way that the camera is seeing the action in a mirror and it’s immediately clear that the shot will determine how the set is staged and dressing placed. On one production I was asked how long it would take me to render a digital model with true reflections so they could determine whether the character would be able to see the other person from where he was seated. I told them it would probably take about an hour to texture the model and do the render they wanted, or I could figure it out with a pencil and it would only take about 2 minutes. They thought I was kidding. You’ll want to have the plan view and an elevation. Line them up so that the plane of the mirror is along an identical line. It doesn’t have to be in any certain scale as long as they are both the same size. 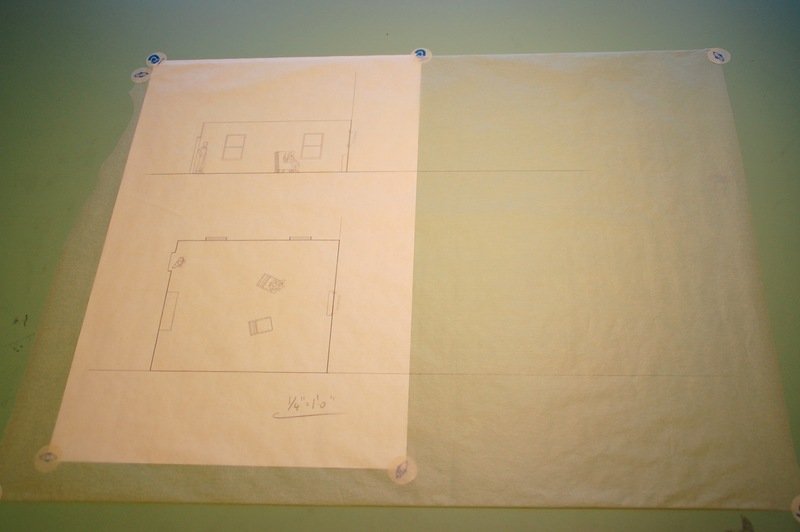 It can be a printout or just a quick drawing on grid paper, as long as the mirror is correctly placed and sized. 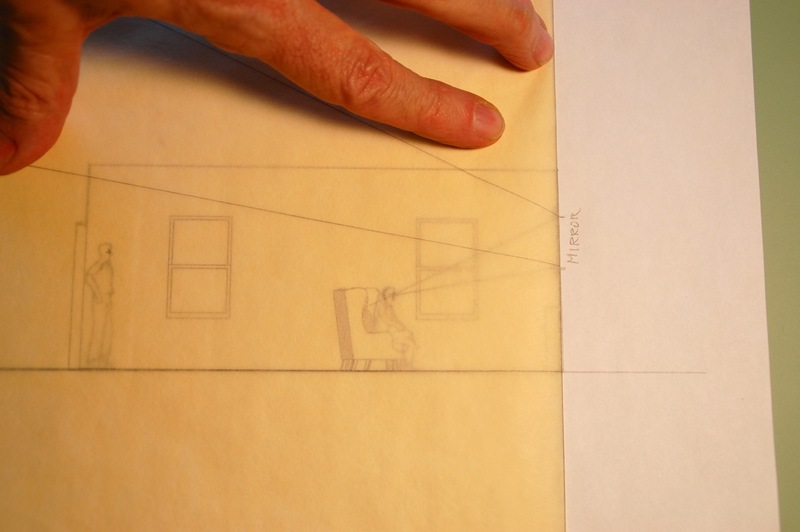 Cover the drawing with trace, being sure to extend it twice as far over the line of the mirror plane. 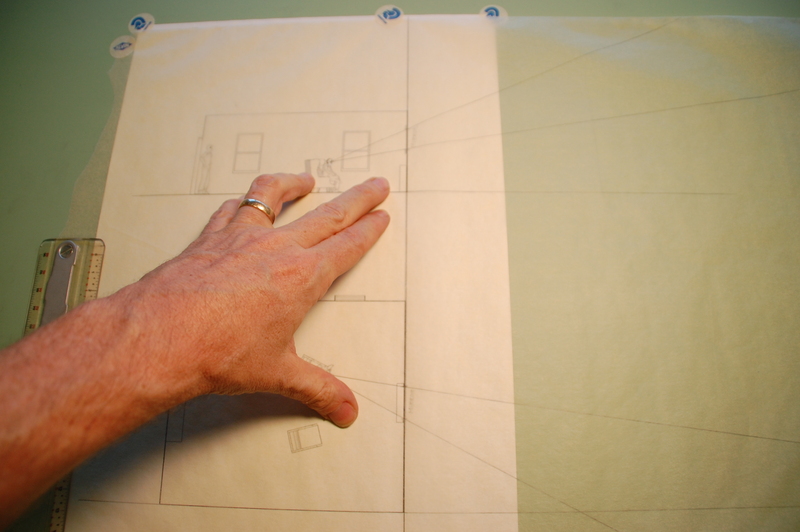 Now draw lines from the vantage point through the edges of the mirror on both the plan and elevation. 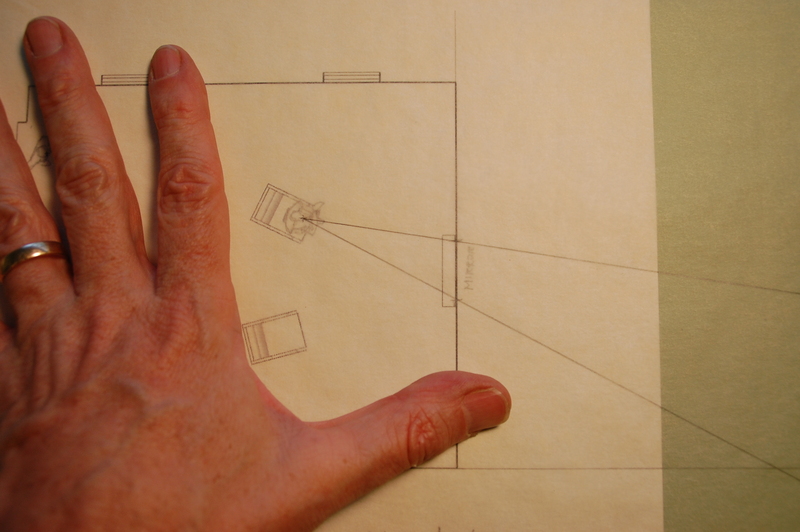 Draw a heavy vertical line through the mirror plane. Then fold the trace along this line. 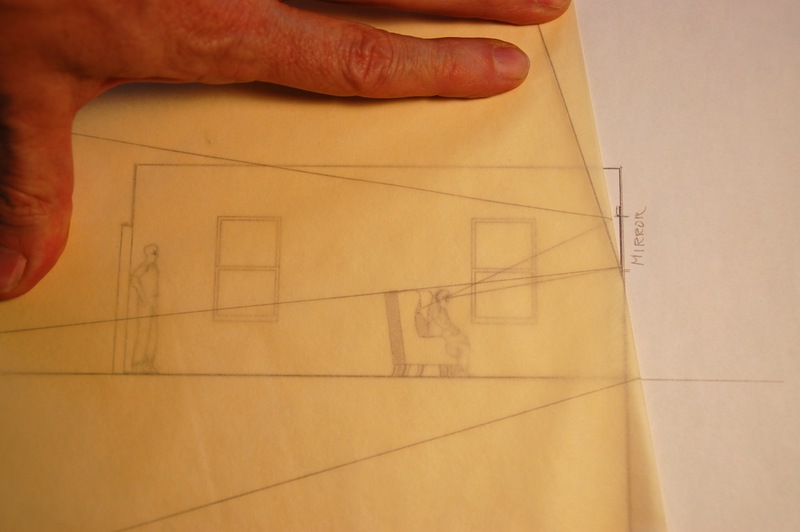 Since the angle of reflection is equal to the angle of incidence, the reflected view is easily seen once the trace is folded back over the drawing, and it’s clear the person in the chair would have no way to see the person standing at the door. 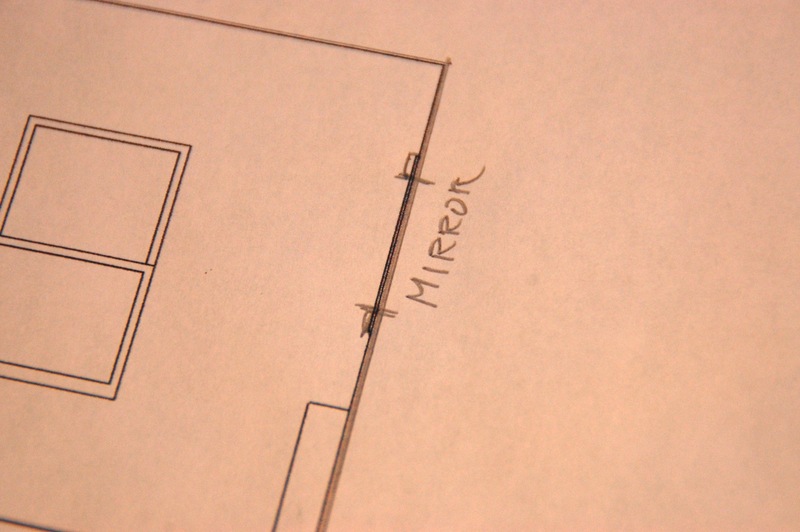 You can now pivot the ‘mirror plane’ down until the person is in view, although it will be clear that in plan the mirror would be at a strange angle from the wall.